Previous post: Good Hair, Bad Hair, My Hair, Your Hair: What Product Works For All? Summertime inevitably involves an epic battle against sun, salt, sand and SWIMMING on a regular basis. Today was no exception but we decided it was a great time to chronicle our wash day regimen for moms new to this natural journey. Let’s rewind just a bit to our wash day experience two years ago, prior to our natural hair journey and PRE-MOISTURE. Her hair would be a tangled mess post swimming. We would throw the shampoo in, dunk her head in conditioner then fight one another to detangle. All that and then styling which could easily add up to a two hour or more battle which totally makes wash day no fun. So today, thanks in large part to the World Cup and our need to get her hair done (keep in mind our many hours of reading, youtube tutorials and the like) our total time – from wash to finished product – was 1 hour (including photo sessions step by step for the blog). If you want to minimize the stress and maximize the moisture follow these important steps. 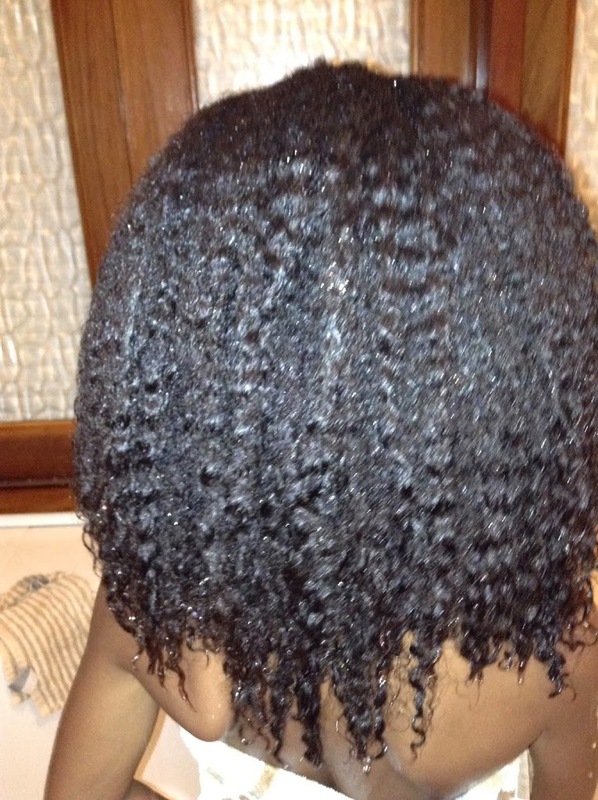 When we first began it was very necessary to section the hair in order to minimize tangling and breakage. Today, we are able to simply wash and condition – finger detangling as we apply the conditioner. Today we used Aubrey Organics Green Tea Clarifying Shampoo, Finish Cream Rinse and Honeysuckle Rose Moisturizing Conditioner. This has been the most important step, by far, for us to retain moisture. The knowledge that moisture is not gained by plying the hair with grease, oils or butter BUT achieved by locking in and sealing the WATER with oils (or butters for thicker textures), has made all the difference to our hair care regimen. Properly moisturizing her hair has led to decreased detangling, increased hair growth and improved the overall health and strength of her hair strands. We chose a two strand twist style to both stretch the hair and allow us more versatility for the school week. Her hair will last up to 4-5 days in this style, we can then refresh the front twists and get another 3 days at which point twists are removed for a twist out style until next wash day. To achieve the moisture required we applied the Camille Rose Coconut Water Leave-In to hair in sections. Hair was then divided into twisting sections, Camille Rose Almond Jai Twist Butter applied along with the Aloe Whipped Gel. For this particular style we did not use the Camille Rose Curl Maker or Moisture Milk – we use those to refresh her hair mid-week. Have fun experimenting but don’t forget to LOC in the moisture! !